Andrew Gillum has hit the Democratic speaking circuit across the nation, urging the party to stay the course on social justice. Last week, Gillum spoke at the Leadership Conference on Civil and Human Rights in Washington and later met with Obama. Days later, he spoke by phone to potential 2020 rival Beto O’Rourke and to former Massachusetts Gov. Deval Patrick, a onetime presidential prospect who praised Gillum. “He was a rock star yesterday, he’s a rock star today, and he will be a rock star in the future,” Tom Perez, chair of the Democratic National Committee, said Tuesday when he introduced the former mayor at a closed-door DNC finance gathering in Washington, where Gillum got a standing ovation, according to two attendees. Gillum says he wants to focus on turning Florida blue by running what would amount to an ongoing outreach and support campaign for the Democratic base: young, minority and poor voters. 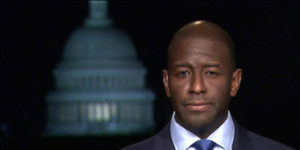 “I see the best and highest contribution that I can make at this time is in taking what we’ve built over the course of 2017 and 2018 and putting that to use and building something more longer term in the state of Florida,” Gillum told POLITICO. But he won’t completely shut the door on a presidential bid in two years. “I have no expectations that I’m going to be running for anything in 2020,” he said. At the DNC meeting, Gillum described the needs of Florida Democrats in almost matrimonial terms. At his closed-door speech Tuesday, attendees said, Gillum stuck to what was his standard 2018 campaign speech. He spoke about his biography (son of a bus driver and construction worker), the gains of Democrats in the recent midterms (they won the U.S. House and flipped two Florida congressional seats blue) and voter disenfranchisement, a trenchant issue in Florida after 65 percent of voters opted to automatically restore the voting rights of nonviolent former felons. Aides and supporters say Gillum is not completely sure about his next steps, but he may head up a political group or movement that focuses on voting rights. His spokeswoman, Kirsten Allen, said he wants to stay true to his campaign and to Florida. On Monday, Gillum gave a “thank you” address to 200 campaign volunteers in Miami and planned to meet with more Tuesday in Tampa and Wednesday in Jacksonville. The grueling travel schedule reminds Gillum of what he would have to go through again, but on a far larger scale, if he ran for president. “I can’t see anything that’s going to cause me to go through 22 months of what I went through,” he said.